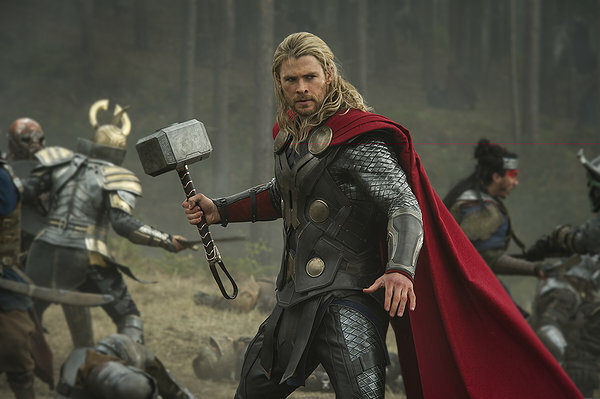 The Marvel Cinematic Universe (which is distinct from but resonates with the comics) finished its first phase with “The Avengers,” and phase two is on its way with “Iron Man 3” and now “Thor: The Dark World.” Marvel is crafting this franchise of films so that they all interlock with each other in various ways, and it works. You don’t have to have seen every single other Marvel film to enjoy them individually, but they are much richer when seen as a whole. The dark elves, believed to be long dead after a crushing defeat by the Asgardians, show up again on Earth – their leader, Malekith (Christopher Eccleston), has a plan to bring all the realms back to their original, dark state, back when the dark elves ruled everything. Thor, along with Jane, her intern Darcy (Kat Dennings), and Dr. Erik Selvig (Stellan Skarsgard), must find a way to stop Malekith before he destroys everything. Since this is a sequel, there’s almost no setup required except for the things that are new to this film in particular. You can jump right in without seeing “Thor,” because there’s enough to go on in the dialog, but the characters arrive fully formed. The first film had a lot to do to establish Thor, Jane, and the rest; this one gets to hit the ground running. We get to see more of Jane and Darcy working (although there’s definitely not enough Darcy, she’s fantastic), more of Loki’s mischievous side, more of pretty much all the secondary characters. The production values are as high as we’ve come to expect from the Marvel Cinematic Universe, and there’s a good deal more humor in this film than in “Thor” – but stronger pathos as well. This film feels much more solid than the first, in part because the actors have more fully-fleshed-out characters to work with. This is a film that fans of the other Marvel films can enjoy, but also one accessible to a newcomer. If you like superheroes, sword-and-sorcery, and strong characters both male and female, “Thor: The Dark World” is for you. And, as with all Marvel films, be sure to stay until the end of the credits. You won’t regret it.